The factory of JFE Steel Corporation is seen in Kawasaki near Tokyo, Japan, March 2, 2018. Several Asian nations that are major trading partners with the U.S. reacted strongly Friday to a U.S. decision to impose tariffs on metal imports, raising concerns of global trade conflicts. 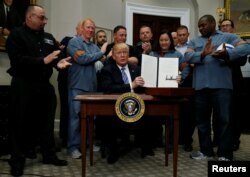 U.S. President Donald Trump is seen after signing a proclamation to establish tariffs on imports of steel and aluminum at the White House in Washington, March 8, 2018. Trump has exempted key exporters of steel and aluminum, Canada and Mexico, while negotiating changes to the North American Free Trade Agreement (NAFTA), and other countries such as Australia also may be spared. 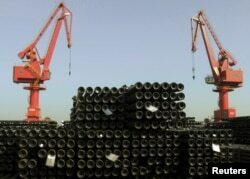 The U.S. is the world's largest importer of steel, totaling 35 million tons of raw material in 2017, with South Korea, Japan, China and India accounting for 6.6 million tons. Thai economist Wisarn Pupphavesa, a senior adviser to the Thai economic think tank, the Thailand Development Research Institute (TDRI), called the tariff aiming to protect U.S. industry a "very bad situation." "The U.S. has been a leader in the multilateral system, the leader in the trade liberalization, and the U.S. played a most important role in writing all the rules that are governing the global market now. But now President Trump decided to break those rules ... so this is a very bad situation," Wisarn told VOA. Economists at London-based Capital Economics said in a release Friday the major concern over U.S. steps to increase tariffs is they mark a "turning point in U.S. policy to a much broader and deeper shift toward protectionism." Malaysia's Second International Trade and Industry Minister, Datuk Seri Ong Ka Chuan, says the government is monitoring the impact of the tariff increase, although steel and aluminum contributed to less than one percent of Malaysia's total exports. FTI secretary general, Korrakod Padungjit, told local media there were several leading exporters — Taiwan, Japan, South Korea, India, China, Vietnam and Turkey — that may now target Southeast Asia.